A South Park episode that mocked actor Tom Cruise and Scientology will air later this month after a repeat of it was axed in March. "This episode just happens to be rotating back in [the schedule]", said Comedy Central spokesman Tony Fox. "If they hadn't put this episode back on air... we wouldn't be doing anything else with them," South Park co-creator Matt Stone told trade magazine Variety. The channel denied pulling the March show to appease Scientologist Cruise. Cruise also denied reports suggesting he threatened not to promote his film Mission Impossible: 3 if the episode was broadcast. The film was released by Paramount, which is owned by Viacom. The company also owns Comedy Central. The cable TV comedy channel said the schedule change in March enabled it to screen two extra episodes featuring Isaac Hayes, who played Chef. 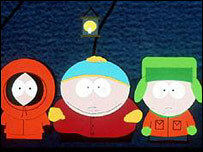 Hayes, also a Scientologist, left South Park just a few days before the re-run was axed. He had objected to an earlier episode sending up his religion. The episode that was dropped in March, titled Trapped in the Closet, will now be shown on Wednesday.